In the mood for something to pair with that gingerbread latte? Almost any sweet cake, bread or cookie can go with the coffee drink, but with the Christmas season approaching, this seems like as good a time as any to play up the gingerbread flavor by matching the drink with an equally seasonal treat. In this case, I’m talking about banana gingerbread. 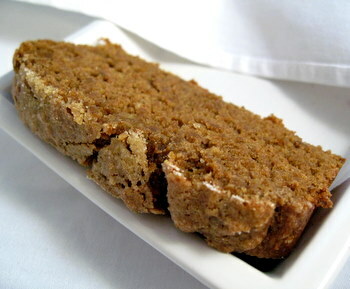 Banana gingerbread, as you might expect, is a hybrid between gingerbread and banana bread. It has a sweet banana-y flavor and a richer molasses-y one, all rolled into the same delicious quickbread. While there is a lot going on in the bread, the overall effect of this combination is pretty mild, so this bread will probably appeal to fans of both gingerbread and banana bread, even if s/he isn’t normally a fan of one of the two products. If you are a fan of both, of course, so much the better. Like most banana breads, this one is moist and a bit on the dense side, thanks to the generous amount of banana puree in the batter. The bread isn’t heavy, fortunately, so the denseness makes it hold up exceptionally well to being served with strong coffee or tea, and makes it sturdy enough that you can easily spread a slice (toasted or plain) with butter or cream cheese. The recipe calls for quite a few different spices, but it is not crucial to use the same amounts of those ingredients that I did. If you like more cinnamon or less allspice, feel free to modify the amounts to suit your own tastes. That said, I would still recommend including a pinch of cardamom and at least a pinch of allspice in addition to whatever else you decide to use. In a large bowl, whisk together flours, baking powder, baking soda, salt and spices. In a medium bowl, whisk together brown sugar, banana, molasses, buttermilk and vegetable oil. Pour into dry ingredients and stir until just ombined. Pour into prepared pan and sprinkle with coarse sugar, if desired. Bake for about 45 minutes, until a toothpick inserted into the center of the loaf comes out clean. Makes 1 loaf, 8-10 slices. I am so going to make this tomorrow, Nicole! One question though, you list the allspice twice……….was one of them supposed to be cloves? Cyndi – It was supposed to be cloves. I’ve fixed the recipe. But I have to say that it wouldn’t be so bad to go with extra allspice, either (can you tell I’m a fan?)! I don’t have access to buttermilk; what substitute could I use for this recipe? Depending on the desired consistency, I’ve substituted plain yogurt, plain yogurt with milk (if it needs to be thinner), or (if you are a vegan / watching the cholesterol) adding an acid to soy milk to cause it to curdle (roughly 1-2 tsps of cider vinegar / lemon juice to 1 cup of soy milk). Really nice recipe! So many banana breads are too loaded with sugar for me. And of course I love all the spices. I’m sick of my customary pumpkin-currant bread, so i might do this instead. I was so excited to see this recipe that I went home and made them last night. I just happened to have all the ingredients on hand (substituting yogurt + lemon juice for the buttermilk), and they turned out so delicious! I actually forgot to add the oil, but you never would have guessed. They were still very moist (and accidentally healthy I suppose!). Instead of making a loaf, I made 12 muffins, and topped them with some crumb topping I had left over from another one of your muffin recipes I made a few weeks back. The topping was perfect. I had them warm and spread with a little butter–after two, I decided I better bring them to work before I ate them all! Is there a mistake in this recipe or are there really no eggs included? Can I say I love you? Would that be too forward of me? I just made this (well, sort of–didn’t have whole wheat so used pulverized oats)(and I left the cloves out–think they’re nasty) and it is Won. Der. Ful. Very good. Yum. I’m always looking for new ways to use up the overripe bananas that I keep in my freezer. Since the season has just recently changed, I thought this would be a great way to use up those bananas and to do something a little seasonal. The bread was absolutely delicious! The combination of spices was wonderful, and I liked how moist the bread stayed, even a few days after baking. I’ll definitely be making this one again–it makes a great breakfast. ** stars I was not too happy with how this bread tasted. I would like to compare it to eating a sweet bagel, tough on the outside and chewy in the inside. And also very filling. This is now my favorite Banana bread. My family and I thank you for the great recipe! I came across your recipe a couple of months ago and since then, I have made it so many times I’ve lost count. I thought I should pass on to you the thanks I receive from my colleagues whenever I bring this cake in to work! It’s incredibly moist and the flavours just seem to get better and more pronounced if left for a couple of days – which is not very often! Let’s try it at home..
what can I substitute the molasses with? Wonderful recipe! I made this just recently and will hopefully be putting it on my blog soon! Thanks for such a creative way to marry two of my favorite flavors!